What first drew me to the book was the picture on the cover – a lady hanging precariously from a rope attached to a tree and a dog swinging! Leafing through the book, Miss. Twiggley seemed an interesting character – quirky and adorable. Written in verse, it is an easy read. The 4 yo had one look at the book and declared it was a long story – but once he got going, he read it again and again! The illustrations have an old-world charm, which makes the book all the more endearing. Miss. Twiggley lived in a tree with a dog named Puss and a color TV. How can a book that starts off like that go wrong? This story of an old lady who lives life on her own terms, and who is a bit shy, is utterly delightful. Haven’t we all felt out of place at some point in our lives – when we find ourselves doing things differently from everyone else around us? It’s not that Miss. Twiggley doesn’t like people, but one does get a bit shy when one lives in a tree. Old Miss. Twiggley has peculiar habits – she is friendly with bears and sleeps in her hat. The townspeople thought it was disgraceful, although Miss. Twiggley and Puss are happy in their house up in the tree. Then, disaster strikes – a hurricane. While the townspeople are left homeless in boats or perched on rooftops, Miss. Twiggley’s unusual way of doing things turns out to be very useful. Up in her house in the tree, Miss. Twiggley gets busy with the bears and Puss – building spare beds and cooking stew. When the wet callers arrive, Miss. Twiggley is ready. She welcomes them all – the mayor, the chief of police, grocer, pigs, cats, dogs. They pretend the house is Noah’s Ark, sing and play games. Everyone is now friends with everyone else. By the time the sun is out, the townsfolk are glad about Miss. Twiggley’s eccentricities. The emergency helps Miss. Twiggley find out something wonderful too. In all the helping and doing, she had forgotten to be shy! A profound message beautifully packaged in a fun story. Timeless. Lovely! You had me at "dog named Puss." I love this blog and can’t get enough of every aspect of it. You are a fabulously talented writer and manage to make everything so relatable. You are so good at this in fact, that sometimes while reading I feel like our hearts and minds become one and basically I feel as if I am reading my own thoughts. 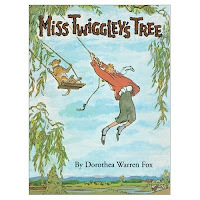 I'm so delighted to see that you have reviewed one of my all-time favorite childhood books, "Miss Twiggley's Tree"! I have now read this book to my own daughter -- it's one of the few books I saved from my childhood. I'm curious where you found this book. I just figured that it was sadly out of print! To the reader in NY - Welcome here, and do keep visiting. This book was borrowed from the library, a 2002 reprint. Did a google search and found it is available on amazon and ebay. Chox - Thanks. And so do we!